Yale Law Professors’ Triple Package: The Key To Success For Minorities In The Legal Profession? – "If you surrender to the wind, you can ride it." 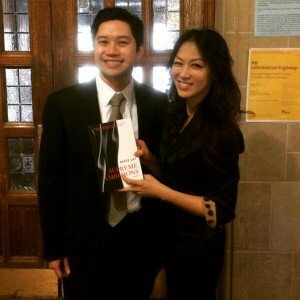 David Lat and Amy Chua at Yale Law this week. The book’s premise is, no doubt, controversial. This is partly because the book attempts to answer “a complicated socioeconomic and cultural question.” Regardless of how you feel about the book, if read in context it can promote much needed discussions regarding racial issues in our society. In addition, minorities in the law can use particular parts of this thesis to better understand how they can become successful in their own careers. If nothing else, The Triple Package can be a guide for what character pathologies minorities should guard against while pursuing their own versions of success. Anytime you talk about achievement in socioeconomic and cultural terms, it is sure to be provocative. But this doesn’t mean that particular influences, traits, and systematic factors aren’t critical to one’s success.